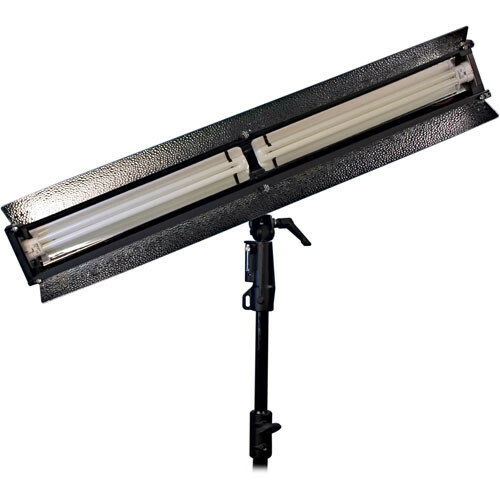 This fluorescent, 110 total watt Ikan Double Line 2-Tube Light with DMX Dimming has push-button dimming on its integrated, flicker-free ballast. Unlike many other manufacturers, Ikan includes an a barndoor intensifier and the fluorescent tubes with the fixture. This model offers DMX dimming control, in addition to the on-board dimmer. Fluorescent tubes included are 3000K with a color rendering of 90+. Lightweight but durable aluminum construction. Height adjustable yoke allows for exact positioning. Push button dimming on rear of the unit. Ready for DMX control.